Concrete is a building material consisting of a binder, sand and fillers, which turns into stone as a result of solidification. No modern construction can do without concrete, whether it is the construction of skyscrapers or the creation of garden paths. Due to its properties and durability, concrete has long been used by man in order to obtain the design of the required shape and strength. However, there is one caveat: only correctly made concrete will meet all requirements. How to make concrete, which will not only be strong, but also durable? Let's get into the essence of this issue, and find out all the details of making the correct concrete mix. In concrete of any brand, cement always acts as a binder. There are many types of cement, such as Portland cement, slag Portland cement, quick-hardening cements and others. 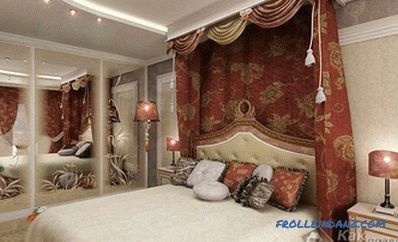 All of them differ in both the quality of binding and the conditions of use of the final product. Portland cement is most often used in construction. All cements used for construction are divided into brands that indicate the ultimate load on the finished product in megapascals. In domestic - the letter D and the number indicating the percentage of impurities are added. For example, portland cement M400-D20 is a material, the finished product from which will withstand a load of 400 MPa, containing up to 20% of impurities. In the manufacture of high-grade concrete, 300 and above, for economic reasons it is necessary to use the brand of cement, which is 2 - 2.5 times higher than the brand of concrete. 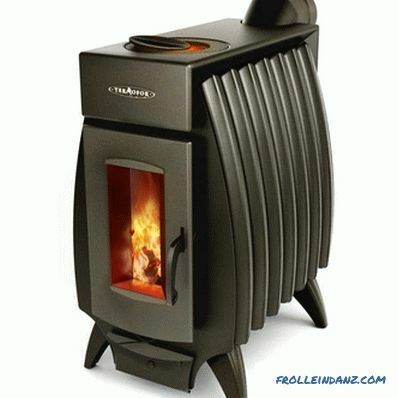 In household construction, Portland brand 400 is often used - its strength is enough for this purpose. In industrial construction, brand 500 cements are used more often, and where heavy loads are expected, special cements of high grades are used. In order to correctly calculate the proportions of concrete, it is necessary to have accurate information about the brand and quality of the cement from which you are going to build. 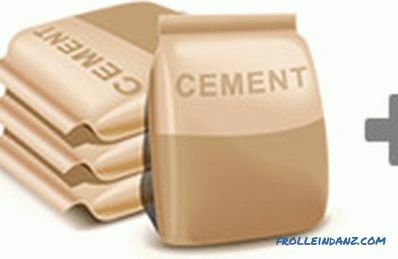 Another important aspect is freshness - cement has a shelf life and eventually loses its properties. Fresh cement - loose dust, without lumps and seals. 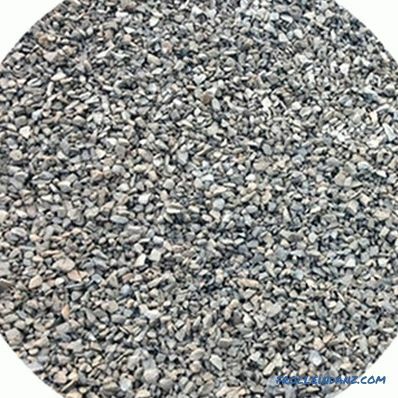 If you see that there are dense pieces in the cement mass, then such cement should not be used in the work - it has absorbed moisture and has already lost its binding properties. Sand can also be different. And the final result directly depends on the quality of this component. Thin (less than 1. 2 mm ). Very small (1. 2 - 1. 6 mm). Minor (1. 6 - 2. 0 mm). Average (1. 9 - 2. 5 mm). Large (2. 5 - 3. 5 mm). 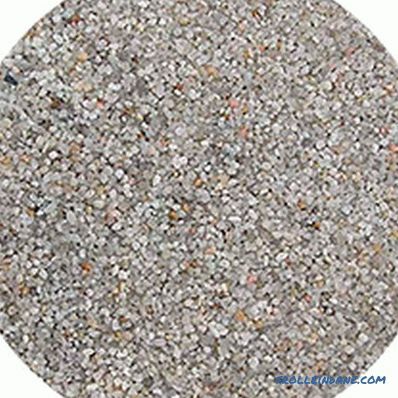 In the manufacture of concrete, all types of sand are used, but if there is a lot of dust or clay particles in the sand, this can significantly impair the characteristics of the mixture. 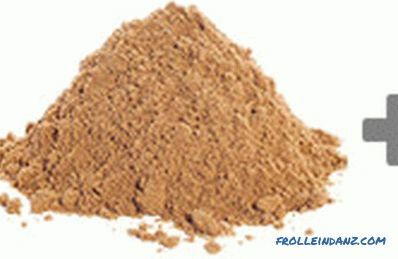 This is especially true of fine sand containing a significant percentage of dust in the composition, it is of little use for the preparation of concrete and is used as a last resort. How to prepare a good quality concrete, and at the same time do not make money with sand? Everything is simple - you should use sea or river sand - these are the cleanest types of building materials that do not carry dust particles or clay. Care must be taken to ensure that the sand is clean and free from organic pollution. Career sand can be very dirty - it is often not used in construction without prior preparation, including washing and upholding. It can also contain a lot of organic garbage - roots, leaves, branches and bark of trees. At hit of such impurity in concrete, emergence of emptiness in the thickness is possible, owing to what, the strength suffers. Another important parameter to consider is the humidity of the sand. Even dry in appearance material can contain up to 2% water, and wet - all 10%. This can disrupt the proportions of concrete, and cause a decrease in strength in the future. 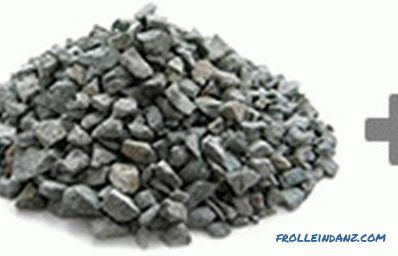 The main filler for concrete of all grades is crushed stone or gravel - crushed rock. 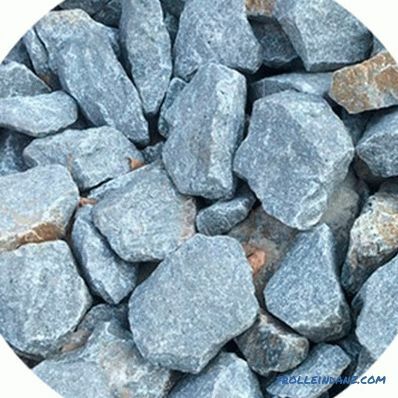 The most commonly used crushed stone. It is also divided into fractions, and has a rough, uneven surface. 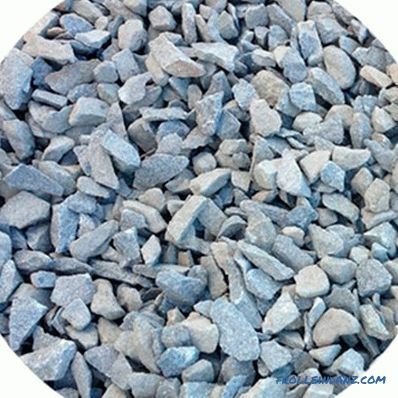 When selecting the composition of concrete, it should also be noted that sea or river pebbles cannot serve as a substitute for rubble, since the smooth, water-polished surface significantly impairs the adhesion of the stone to the other components of the mixture. Very small - 3 - 10 mm. Fine - 10 - 20 mm. Average - 20 - 40 mm. Large - 40 - 70 mm. In order for your concrete to stand for many years and not collapse, remember that the maximum size of stones in gravel should not exceed 1/3 of the minimum thickness of the future product. Another factor is taken into account such as the hollowness of the filler - the volume of the empty space between the rubble stones. It is easy to calculate it - take a bucket of known volume, fill it with rubble to the brim, and pour water into it with a measuring container. Knowing how much liquid has entered, we can calculate the emptiness of rubble. For example, if in a 10 liter bucket of rubble 4 liters of water have climbed, then the emptiness of this rubble is 40%. The smaller the voidness of the filler, the less sand consumption, and, importantly, cement. 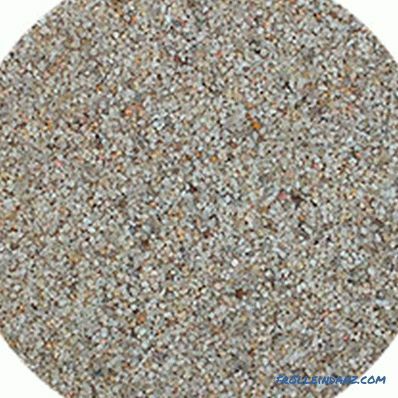 To maximize the filling of voids, you should apply different crushed stone fractions: small, medium, large. It should be borne in mind that the fines should be at least 1/3 of the total rubble. 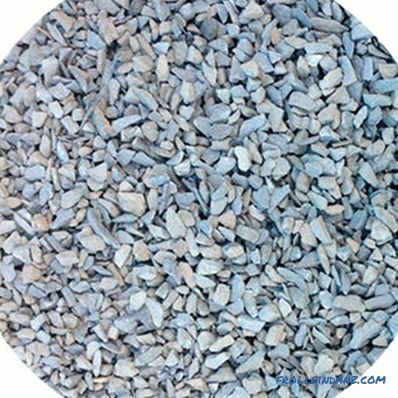 In addition to granite rubble and gravel, depending on the purpose of the concrete, expanded clay, blast furnace slag, as well as other fillers of artificial origin are used. For lightweight concrete used wood shavings, and shredded polystyrene foam. For ultralight concrete - gases and air. However, the creation of light and ultralight concrete is associated with a number of difficulties, and it is unlikely that it will be possible to properly produce such a product outside the industrial workshop. Depending on the density, all aggregates for concrete are divided into porous (2000 kg / m 3 ) and dense (2000 kg / m 3 ). Also, do not forget that natural fillers have a small background radiation, which is inherent in all granite rocks. Of course, this is not a source of radiation pollution, but still it is worth remembering about this property of natural stone as a concrete filler. Water is no less important a component than cement or sand. You can take as a rule one simple truth - any water suitable for drinking is also suitable for mixing concrete. In no case can not use water from an unknown source, waste water after production, swamp and other water, in which quality you are not sure. The chemical composition and other indicators of water can greatly affect the strength characteristics of the finished concrete. It is important to remember that the calculation of the composition of concrete includes all the moisture present in the building materials before they are mixed. If, for example, blast furnace slag is planned as a filler, then its humidity also matters - in fact, this is “extra” water, which is difficult to take into account, but it can simply ruin the ready-made solution. Another important indicator depends on the amount of water - the plasticity of the finished concrete. To obtain plastic concrete, water must be added strictly according to the norm. 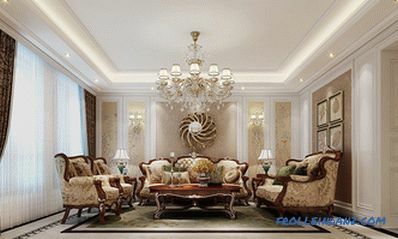 Exceeding the required rate is also harmful, as well as the lack of water - concrete splits, and loses its quality. When mixing the concrete mixture, the plasticity of the concrete is determined by the "eye". If the concrete spontaneously slides off with a horizontal spade, then it is considered very plastic. If from a shovel it crawls only when it is slightly inclined, then the concrete is considered medium plastic. When the concrete does not slide down even with a bowed shovel, it is considered little plastic. When concrete lies on a spade with a hillock, it is considered not plastic. It is impossible to make concrete too liquid as it loses its qualities. Concrete grade is the ability of the finished product to withstand a load of 1 cm 2 without damage. The brand of concrete is determined on the 28th day after its manufacture. The fact is that the fastest concrete gains strength in 7 days. During this time, he can gain up to 40% strength. After 7 days, a good set of strength goes up to 28 days.After the passage of 28 days, the strength increase decreases sharply, but it continues for some time. 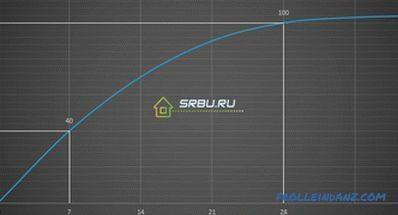 Graph of the strength of concrete, under normal conditions. To correctly calculate the composition of concrete, it is important to have certain data. Data on granulometric composition of sand and rubble. There are two ways to calculate the composition of concrete - based on the weight ratio of cement, sand and rubble and the volume ratio of these materials. Both in the first and in the second case cement is always taken as a unit (per one part), and all other components of the concrete mix as part of the weight or volume of cement. Let's calculate the composition, to produce concrete of medium plasticity, strength mark of which will be M200 for 28 days. For beginning we need to determine the water-cement ratio (W / C). V / C is the proportion of the weight of water and cement, which is necessary for the preparation of concrete of a certain strength. This indicator is determined by the formulas or empirically. We propose the already found values ​​of V / C, which are collected in the form of a table. Table No. 2. 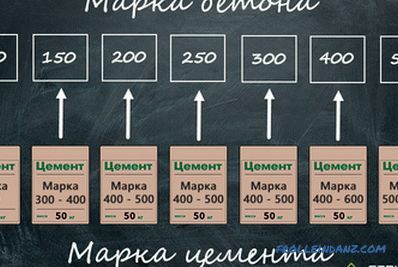 Values ​​of W / C for various grades of concrete. - indicators for gravel. - indicators for rubble. Knowing the required grade of concrete and the used grade of cement, we find the value of W / C. In this case, it will be 0.63. Now from table No. 1 we find the necessary amount of water to produce concrete of medium plasticity, with a gravel size of 40 mm. As a result, we get a value of 190 l / m 3 . After that we can calculate the amount of cement we need per 1 m 3 concrete. To do this, 190 l / m 3 divide by 0.68 and get 279 kg. cement. From table No. 3 we find the proportions of the concrete mix, for the required grade of concrete M200 and the grade of cement M400. Table No. 3. Weight ratios of cement, sand and rubble. Cement - 13 - 15 kg, depends on the seal. 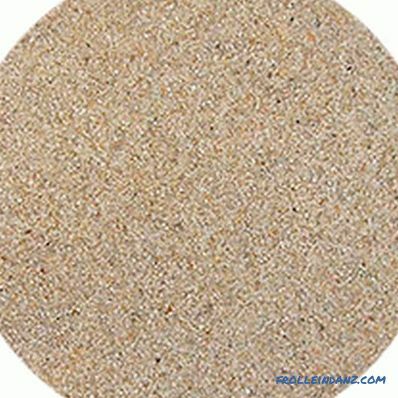 Sand - 14 - 17 kg, depending on humidity. 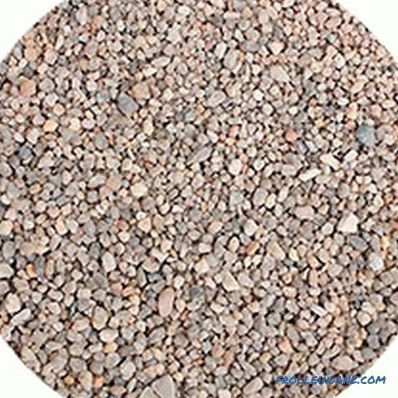 Crushed stone or gravel - 15 - 17 kg, depending on the size of the fraction. It should be understood that the method of this calculation is slightly inferior to the methods used in the construction of large objects, but this is much better than the principle - let's have more cement to make it stronger. In addition to the use of proportions by weight, the proportions of the composition of concrete by volume are also used. However, this method is less accurate. The amount of water is not specified and depends on the desired consistency and plasticity of the concrete. There is both a manual kneading method and a mechanized one using concrete mixers and mixers. Let's consider the manual method of kneading, as the most popular in home construction. For the proper mixing of the mixture, a container is needed in which all the components will be mixed. This can be either a regular tin trough or a specially collected container. All the sand necessary for kneading is poured into it, and cement is poured into the furrow in the middle. 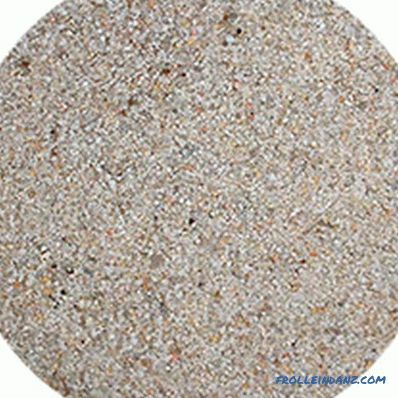 After sand is thoroughly mixed with cement, to obtain a homogeneous gray mass. Then the resulting material is moistened with water, and again well mixed. Later, crushed stone is added, and the mixture is interfered to the state when the solution will cover each stone of the filler. 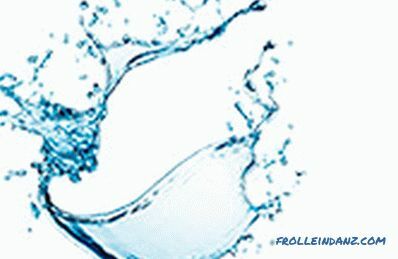 At the same time, water is gradually added, the amount of which depends on the required plasticity. After the mixture becomes homogeneous and all the aggregate stones are covered with mortar, the concrete is ready for laying. With the manual kneading method, there is one important point, namely, the speed of laying concrete. Even with a slight delay, the concrete in the trough can exfoliate (it looks like water coming out from above) and lose some of its properties. 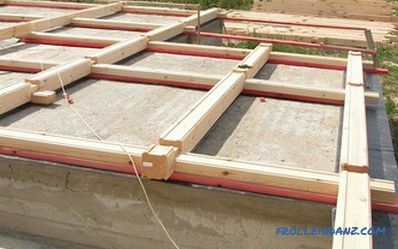 Therefore, it is important to quickly lay the concrete in the formwork. 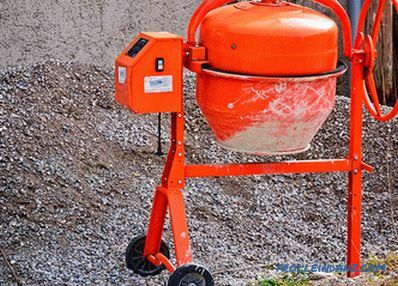 The best way to prepare concrete will be a mechanical method of kneading using a concrete mixer. Advantages of this method will be guaranteed to obtain a homogeneous mixture and high quality of the resulting concrete. 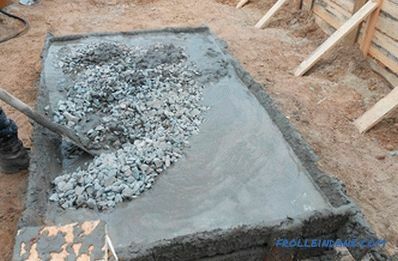 To knead in a concrete mixer, first pour the cement and pour in a minimum of water. After receiving a homogeneous emulsion, sand is added to the mixer at the rate of proportion. Next, the solution interferes with the addition of the required amount of water. After receiving the solution, a filler can be poured into the concrete mixer. 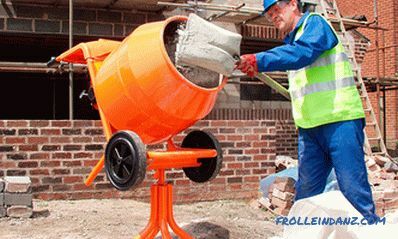 The advantage of the mechanical method of mixing is that the concrete does not separate and can remain in the rotating mixer for up to one hour without losing its properties. However, the mixer should not be placed far from the place of laying - in order to avoid the loss of concrete of its properties during delivery. By following these simple rules, you will get reliable structural material, which over the years will grow stronger!